Register yourself into to Kyvyt.fi first through Optima. Once you have registered yourself to Kyvyt.fi and created a username and password you can always use Kyvyt.fi, even after your studies. After registering you can log in to Kyvyt.fi both through Optima and directly on Kyvyt.fi web page. First log in to Optima at http://optima.jamk.fi. There’s a blue Briefcase icon on the top right corner. Click it. You’ll be moved to Kyvyt.fi. If you already have content in Kyvyt.fi, click Use existing. If this is your first time to use Kyvyt.fi, click Create new. Read the Terms and Conditions of the Kyvyt.fi site and scroll down the page. Click the Accept button. Read the instructions carefully and choose your username and password. You should use the email provided by JAMK as a primary email. Information with red star is required. After you have filled in all the information, click Submit. Click Blogs on the top. Then click Create a new blog. Give a title to your blog and write a description. Then click Create blog. You will find your blog on the top line in Blogs. Click the name of your blog. To finish creating your blog click Publish blog. At this point your blog is not yet visible. You can set and modify access rights for viewing your blog at this point or later on. See instructions below: Kyvyt.fi Edit access – Sharing. 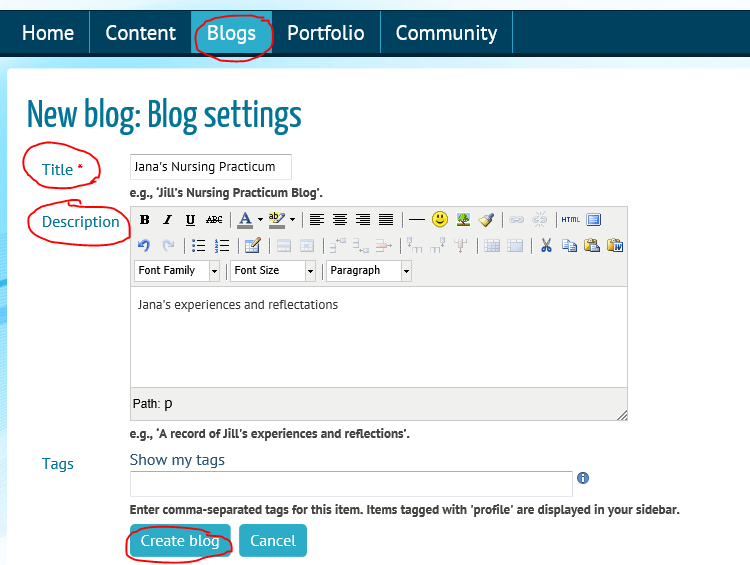 You can always get to your blog by clicking Blogs on the top line. Click Blogs on the top line. Click the name of your blog. First click “Edit Access” (key) icon. You can edit access through several short cuts. By default, only you can see your own content. You can share content by editing access rules. See Share with -> choose Secret URL. This option creates you an URL to your blog. You can copy the created and send it via email. You can also set a Password to your page (not recommended). Remember to Save!